Complete genome sequence of Rhizobium leguminosarum bv. trifolii strain WSM1325, an effective microsymbiont of annual Mediterranean clovers. The productivity of agricultural systems is heavily dependent on nitrogen (N) . The requirement for N-input can be met by the application of exogenous N-fertilizer manufactured through the Haber-Bosch process, but as the cost of fossil fuel-derived energy increases, so does the cost to manufacture and apply such fertilizer. Furthermore, there are inherent issues with the synthesis and application of N-fertilizer, including greenhouse gas emissions and run-off causing eutrophication. Alternatively, N can be obtained from symbiotic nitrogen fixation (SNF) by root nodule bacteria (rhizobia) on nodulated legumes ; this is a key biological process in natural and agricultural environments driven by solar radiation and utilizing atmospheric CO2. The commonly accepted figure for global SNF in agriculture is 50-70 million metric tons annually, worth in excess of U.S. $10 billion . Rhizobia are applied across 400 million ha of agricultural land per annum to improve legume forage and crop production through symbiotic N-fixation . The clover (Trifolium) nodulating Rhizobium R. leguminosarum bv. trifolii is amongst the most exploited species of root-nodule bacteria in world agriculture. Clovers are widely grown pasture legumes and include both annual species (e.g. T. subterraneum) and perennial species (e.g. T. pratense, T. repens and T. polymorphum). Clovers are adapted to a wide range of environments, from sub-tropical to moist Mediterranean systems, and thus are important nitrogen-fixing legumes in many natural and agricultural regions of North and South America, Europe, Africa and Australasia . Rhizobium leguminosarum bv. trifolii strain WSM1325 was isolated from a nodule recovered from the roots of an annual clover plant growing near Livadi beach on the Greek Cyclades island of Serifos in 1993 . Strain WSM1325 is of particular interest because it is a highly effective nitrogen-fixing microsymbiont of a broad range of annual clovers of Mediterranean origin  and is also saprophytically competent in acid, infertile soils of both Uruguay and southern Australia . Strain WSM1325 is an effective microsymbiont under competitive conditions for nodulation in what appears to be a host-mediated selection process . As well as being a highly effective inoculant strain for annual Trifolium spp., strain WSM1325 is compatible with key perennial clovers of Mediterranean origin used in farming, such as T. repens and T. fragiferum, and is therefore one of the most important clover inoculants used in agriculture. However, WSM1325 is incompatible with American and African clovers, sometimes nodulating but never fixing N . This is in contrast to other Rhizobium leguminosarum bv. trifolii strains, such as WSM2304, which are effective at N-fixation with some perennial American clovers, but ineffective with the Mediterranean clovers [5-7]. Here we present a summary classification and a set of features for R. leguminosarum bv. trifolii strain WSM1325 (Table 1), together with the description of a complete genome sequence and annotation. Classification and general features of R. leguminosarum bv. trifolii WSM1325 according to the MIGS recommendations . Evidence codes - TAS: Traceable Author Statement (i.e., a direct report exists in the literature); NAS: Non-traceable Author Statement (i.e., not directly observed for the living, isolated sample, but based on a generally accepted property for the species, or anecdotal evidence). These evidence codes are from Web Site of the Gene Ontology project . If the evidence code is IDA, then the property was directly observed by one of the authors or an expert mentioned in the acknowledgements. R. leguminosarum bv. trifolii WSM1325 is a motile, Gram-negative, non-spore-forming rod (Figure 1A,B) in the Rhizobiaceae family of the class Alphaproteobacteria that forms mucoid colonies (Figure 1C) on solid media . It has a mean generation time of 3.9 h in rich medium at the optimal growth temperature of 28°C . Images of R. leguminosarum bv. 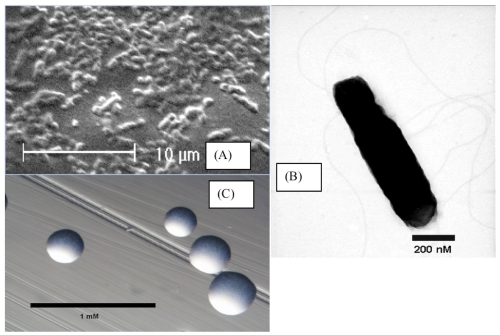 trifolii strain WSM1325 using scanning (A) and transmission (B) electron microscopy and the appearance of colony morphology on solid media (C). Figure 2 shows the phylogenetic neighborhood of R. leguminosarum bv. trifolii strain WSM1325 in a 16S rRNA-based tree. An intragenic fragment of 1,440 bp was chosen since the 16S rRNA gene has not been completely sequenced in many type strains. A comparison of the entire 16S rRNA gene of WSM1325 to completely sequenced 16S rRNA genes of other rhizobia revealed 100% gene sequence identity to the same gene of R. leguminosarum bv. trifolii strain WSM2304 but revealed a 1 bp difference to the same gene of R. leguminosarum bv. viciae strain 3841. 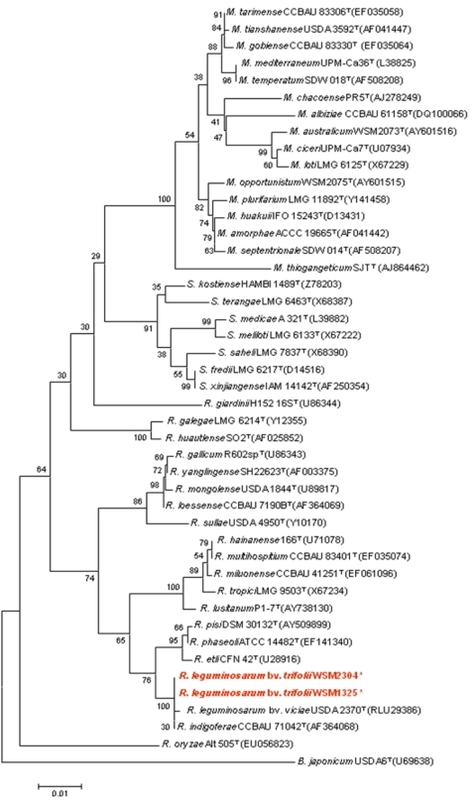 Phylogenetic tree showing the relationships of R. leguminosarum bv trifolii strain WSM1325 with the type strains of Rhizobiaceae based on aligned sequences of the 16S rRNA gene (1,440 bp internal region). All sites were informative and there were no gap-containing sites. Phylogenetic analyses were performed using MEGA, version 3.1 . Kimura two-parameter distances were derived from the aligned sequences  and a bootstrap analysis  as performed with 500 replicates in order to construct a consensus unrooted tree using the neighbor-joining method  for each gene alignment separately. B.-Bradyrhizobium; M.-Mesorhizobium; R.-Rhizobium; S-Ensifer (Sinorhizobium). Type strains are indicated with a superscript T. Strains with a genome sequencing project registered in GOLD  are in bold red print. Published genomes are designated with an asterisk. R. leguminosarum bv. trifolii WSM1325 nodulates (Nod+) and fixes nitrogen effectively (Fix+) with a wide range of annual clovers of Mediterranean origin which are in commercial agriculture, globally. Examples of these clover species include T. subterraneum, T. vesiculosum, T. purpureum T. glanduliferum, T. resupinatum, T. michellianum and T. incarnatum. An illustration of the ability of WSM1325 to fix nitrogen effectively across a range of annual clover species is displayed in Figure 3. Additionally, WSM1325 is Fix+ with some Mediterranean perennial clovers such as T. repens and T. fragiferum, but is inconsistently Nod+, and consistently Fix- with clovers of African and American origin [5,30]. Under conditions of competitive nodulation, WSM1325 may preferentially nodulate T. purpureum even when outnumbered 100:1 by WSM2304 . An illustration of the N-fixing capacity of R. leguminosarum bv. trifolii WSM1325 with four annual Trifolium spp. (T. vesiculosum, T. dasyurum (pots with orange tags), T. isthmocarpum and T. spumosum (pots with blue tags) in four replicates, front to back), compared with superseded Australian inoculants; far left WU95 (1968 to 1994), middle WSM409 (1994 to 2004) and right, WSM1325 (Australian commercial inoculant strain 2004 to present ). This organism was selected for sequencing on the basis of its environmental and agricultural relevance to issues in global carbon cycling, alternative energy production, and biogeochemical importance, and is part of the Community Sequencing Program at the US Department of Energy Joint Genome Institute (JGI) for projects of relevance to agency missions. The genome project is deposited in the Genomes OnLine Database  and the complete genome sequence in GenBank. Sequencing, finishing and annotation were performed by the DOE Joint Genome Institute (JGI). A summary of the project information is shown in Table 2. Genome sequencing project information for R. leguminosarum bv trifolii WSM1325. R. leguminosarum bv. trifolii WSM1325 was grown to mid logarithmic phase in TY medium (a rich medium)  on a gyratory shaker at 28°C. DNA was isolated from 60 mL of cells using a CTAB (Cetyl trimethylammonium bromide) bacterial genomic DNA isolation method (Web Site). The genome was sequenced using a combination of Sanger and 454 sequencing platforms. All general aspects of library construction and sequencing performed at the JGI can be found at Web SiteWeb Site. 454 Pyrosequencing reads were assembled using the Newbler assembler, version 1.1.02.15 (Roche). Large Newbler contigs were broken into 6,084 overlapping fragments of 1,000 bp and entered into assembly as pseudo-reads. The sequences were assigned quality scores based on Newbler consensus q-scores with modifications to account for overlap redundancy and to adjust inflated q-scores. A hybrid 454/Sanger assembly was made using the parallel phrap assembler (High Performance Software, LLC). Possible mis-assemblies were corrected with Dupfinisher or transposon bombing of bridging clones . Gaps between contigs were closed by editing in Consed, custom primer walk or PCR amplification. A total of 2,155 Sanger finishing reads were produced to close gaps, to resolve repetitive regions, and to raise the quality of the finished sequence. Together, all sequence types provided 36× coverage of the genome. The error rate of the completed genome sequence is less than 1 in 100,000. Genes were identified using Prodigal  as part of the Oak Ridge National Laboratory genome annotation pipeline, followed by a round of manual curation using the JGI GenePrimp pipeline . The predicted CDSs were translated and used to search the National Center for Biotechnology Information (NCBI) nonredundant database, UniProt, TIGRFam, Pfam, PRIAM, KEGG, COG, and InterPro databases. Additional gene prediction analyses and functional annotation were performed within the Integrated Microbial Genomes (IMG-ER) platform (Web Site) . The genome is 7,418,122 bp long with a 60.77% GC content (Table 3) and comprised of 6 replicons; one circular chromosome of size 4,767,043 bp and five circular plasmids of size 828,924 bp, 660,973 bp, 516,088 bp, 350,312 bp and 294,782 bp (Figure 4). Of the 7293 genes predicted, 7,232 were protein coding genes, and 61 RNA only encoding genes. Two hundred and thirty one pseudogenes were also identified. The majority of genes (74.21%) were assigned a putative function whilst the remaining genes were annotated as hypothetical proteins. The distribution of genes into COGs functional categories is presented in Table 4. Genome Statistics for R. leguminosarum bv trifolii WSM1325. 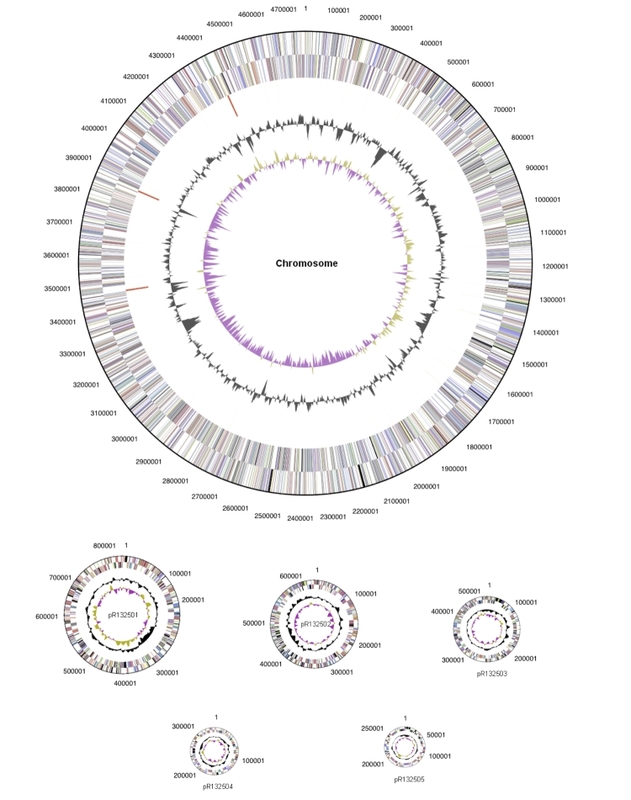 Graphical circular maps of the chromosome and plasmids of R. leguminosarum bv trifolii WSM1325. From outside to the center: Genes on forward strand (color by COG categories as denoted by the IMG platform), Genes on reverse strand (color by COG categories), RNA genes (tRNAs green, sRNAs red, other RNAs black), GC content, GC skew. Chromosome and plasmids are not drawn to scale. The number of predicted protein-coding genes of R. leguminosarum bv trifolii WSM1325 associated with the 21 general COG functional categories. This work was performed under the auspices of the US Department of Energy's Office of Science, Biological and Environmental Research Program, and by the University of California, Lawrence Berkeley National Laboratory under contract No. DE-AC02-05CH11231, Lawrence Livermore National Laboratory under Contract No. DE-AC52-07NA27344, and Los Alamos National Laboratory under contract No. DE-AC02-06NA25396. We thank Gordon Thompson (Murdoch University) for the preparation of SEM and TEM photos. We gratefully acknowledge the funding received from Murdoch University Strategic Research Fund through the Crop and Plant Research Institute (CaPRI), and the Grains Research and Development Corporation (GRDC), to support the National Rhizobium Program (NRP) and the Centre for Rhizobium Studies (CRS) at Murdoch University. Peoples MB, Hauggaard-Nielsen H, Jensen ES. Chapter 13. The potential environmental benefits and risks derived from legumes in rotations. In: Emerich, DW & Krishnan HB (Eds. ), Agronomy Monograph 52. Nitrogen Fixation in Crop Production Am Soc Agron, Crop Sci Soc Am & Soil Sci Soc Am 2009, pp. 349-385 Madison, Wisconsin, USA. Sprent JI. Legume nodulation: a global perspective. 2009. Oxford, Wiley-Blackwell. Zohary M, Heller D. The Genus Trifolium The Israel Academy of Sciences and Humanities, Ahva Printing Press 1984, Jerusalem. Kuykendall LD, Hashem F, Wang ET. Genus VII. Rhizobium, 2005, pp 325-340. In: Bergey’s Manual of Systematic Bacteriology Second Edition. Volume 2 The Proteobacteria Part C The Alpha-, Delta-, and Epsilonproteobacteria Brenner DJ, Krieg NR, Staley JT (Eds. ), Garrity GM (Editor in Chief) Springer Science and Business Media Inc, New York, USA. Centre for Rhizobium Studies. Annual Report. 2001. JG Howieson (Ed). Murdoch University Print, Perth, Australia.